This is good - and BZ to all involved. Anwar al-Aulaqi, a radical U.S.-born Muslim cleric and one of the most influential al-Qaeda operatives wanted by the United States, was killed Friday in an airstrike in northern Yemen, authorities said, eliminating a prominent recruiter who inspired attacks on U.S. soil. In Washington, a senior Obama administration official confirmed that Aulaqi is dead. A U.S. counterterrorism official said intelligence indicates that the 40-year-old cleric, a dual national of the United States and Yemen, perished in an attack on his convoy by a U.S. drone and jet, the Associated Press reported. Nice to see everyone getting to a mature understanding that some people just need to be killed and are not worth the effort to capture and take to court. This bit of FOD was on the short list. Rinse, repeat. ... but, everyone needs to be reminded of this. I can tell you - no one wanted to know. That was then, this is now. Funny how things fold in to each other. I was pondering one of the pivotal scenes of Hemingway's A Farewell To Arms , where in a general retreat, he is pulled to the side by the Carabinieri, as all officers were. They were being briefly interviewed - and then shot. Shot by the very Army that ordered them to retreat in the face of the advancing Germans and Austo-Hungarians. I decided to dig a bit into the background of the real battle that was the backdrop, and came across this piece of work; Field Marshall Luigi Cadorna. Battle Caporetto. That rang a bell. Part of that campaign was the Battle of Longarone. Why is that of significance? Well ... one of my favorite military minds is Field Marshall Rommel. I got along real well with a German Army 1-star who, much to my shock, had a portrait of him in his office. From him I learned that there are very few WWII officers who are acceptable to have pictures of in your office in the 21st Century German Army - in uniform nontheless. Rommel was one. One thing that broke Rommel apart from many of his peers was that in WWI he won the "Pour le Merite" - the Blue Max. It is hard to find out how though. Such an award should not be an afterthought. Well - let's give the good JO his moment. Above you have a horrible battlefield leader - and below let's review the moment that helped bring one of the best battlefield leaders, of any army. Let's spend a moment to review Rommel at the Tactical level as a JO. David Irving, in his paper The Trail of the Fox, gives the best account. General von Below’s aim was to penetrate the main defense line south of the Isonzo River. The high points of the line were the towering Monte Mataiur, Monte Kuk, Kolovrat Ridge and Hill1114. Tens of thousands of Italian troops and well-constructed gun sites commanded each of these high points, and the German unit commanders scrambled to take them, knowing that honors would be the reward. The rivalry among these young officers leading proud units from the German provinces of Bavaria, Silesia and Rommel’s Swabia was ferocious. 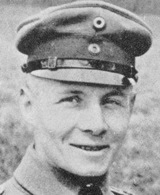 Lieutenant Ferdinand Schoerner, a Bavarian commander, set the pace, driving his coughing, staggering volunteers so ruthlessly forward despite their heavy loads of machine guns and ammunition that one of his men dropped dead from exhaustion before the unit reached the objective: Hill 1114, key to the whole Kolovrat Ridge. For taking Hill 1114, Schoerner was awarded Prussia’s highest medal, the Pour le Mérite. That out- raged Rommel. He considered that the credit was due him. Rommel’s part in breaching the Kolovrat position was in- deed great. As night fell on that first day of the offensive, Scho- erner’s promising position had seemed thwarted by Italian fortifi- cations. 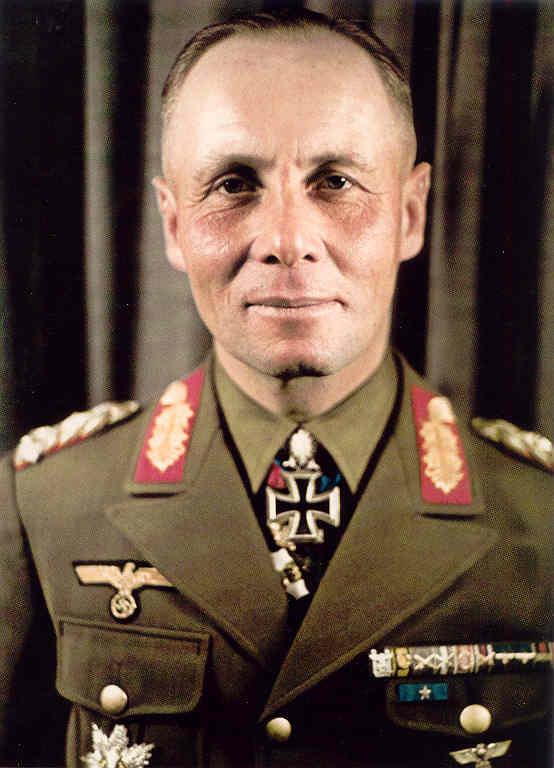 Rommel’s superior, Major Theodor Sproesser, commander of the Swabians, wrote a battle report, a faded copy of which still survives, which describes the emplacements. “Like fortresses,” he wrote, “the strongly built concrete gun positions . . . look out over us. They are manned by hard-bitten machine gunners, and bar our further advance to south and west.” During the night Rommel reconnoitered the enemy defenses and found a gap, and shortly after dawn his Abteilung penetrated the Italian lines. Three hours later he stormed Monte Kuk itself. Finding Rommel in their rear, the Italians panicked, their line began to crumble and German infantry poured through the breach. But Schoerner, the Bavarian, got the Pour le Mérite! Rommel was stung by this injustice, and after the war he asked the official army historian to make petty corrections to the re- cord; he even arranged for future editions to read “Leutnant,” not “Oberleutnant,” in referring to Schoerner, and he persuaded the Reich government to print a fourteen-page supplement which in part set out his own role in more vivid detail describing how forty Italian officers and 1,500 men had surrendered to Oberleutnant Rommel, how he had pressed on ahead of his unit with only two officers and a few riflemen, how the Italians had surrounded and embraced him and chaired him on their shoulders and rejoiced that the war was over for them. This sort of prideful revisionism would become part of the Rommel style. Hesitantly, one Italian after another came out into the open and surrendered. At 11:30am. the last 120 men on the actual summit surrendered to Rommel. Ten minutes later he stood there himself. He ordered one white and three green flares fired to announce his triumph. Rommel had reached the top first and victory was his all the sweeter, too, for having cost the life of only one of his men. The victory soon turned sour. Next day General Erich von Ludendorff, chief of the General Staff, announced the capture of Monte Mataiur by the gallant Lieutenant Walther Schnieber, a Silesian company commander. Schnieber accordingly carried off the prize promised by General von Below for the feat, the coveted Pour le Mérite. It was obvious to Rommel that Schnieber had captured the wrong summit. Choking with anger, he complained to his battal- ion commander, Major Sproesser. Sproesser advised him to forget the matter, but Sproesser did mention in his dispatch of November that during the hour that Rommel’s Abteilung had rested on the Mataiur’s summit they never saw any signs of the Silesian regiment. Rommel was not satisfied, and according to his own account many years later he sent a formal complaint all the way up to the commander of the Alpine Corps, claiming that the medal belonged by rights to him. Silence was the only reply. This disappointment did not affect Rommel’s fighting zeal. He stayed hard on the heels of the retreating Italians. His Abteilung was at the head of Sproesser’s battalion of Swabians, and that battalion was the spearhead of the whole Fourteenth Army. On November the river Tagliamento was reached. Now Rommel began a relentless pursuit of the demoralized Italians, using the same tactics of bluff, bravado, surprise attack and rapid pursuit that were to distinguish him later as a tank commander. He had found his métier. He had learned how to exploit sudden situations even when it meant disobeying orders from superiors. He led his troops to the limits of human endurance so as to take the enemy by surprise climbing through fresh snowfalls that were murder to the heavily laden men, scaling sheer rock faces that would give pause even to skilled mountaineers, risking everything to work his handful of intrepid riflemen and machine gunners around behind the unsuspecting Italian defenders. He suddenly attacked the enemy however greatly he was himself outnumbered from the rear with devastating ma- chine gun fire on the assumption that this was bound to shatter the morale of even the finest troops. His little force’s victories were remarkable. On November 7, Rommel’s companies stormed a 4,700-foot mountain and captured a pass. Two days later he launched a frontal attack on some seemingly invincible Italian defenses and captured another pass. Then followed an action of the purest Wild West, one that wonderfully illustrates Rommel’s physical courage and endurance. He was following an extremely narrow and deep ravine to- ward the town of Longarone the kingpin of the entire Italian mountain defensive system. What Rommel found ahead of him was a road blasted into the vertical rock face soaring 600 feet above. The road first clung to one side of the ravine, then crossed to the other side by a long bridge precariously suspended some 500 feet above the ravine floor. The Swabians took the next stretch of road at a trot. But when they emerged from the valley, they came under heavy rifle and machine gun fire from the direction of Longarone, about a half mile away. Between them and the town lay the river Piave. Almost at once a loud explosion signaled the demolition of the only bridge across the river. Through field glasses Rommel could see endless columns of Italians fleeing south on the far side of the river. The town itself was jam-packed with troops and war paraphernalia. He ordered one of his companies and a machine gun platoon to advance downstream. He himself went with them, then watched as eighteen of his men successfully braved the Piave’s fast-flowing waters under violent enemy machine gun fire. More men followed, and by 4:00 pm they had established a posi- tion on the other shore, a short distance south of Longarone. From there they could block the road and railway line leading out of town. Over the next two hours this small force disarmed 800 Italian soldiers who ran into their trap. As dusk fell, Rommel himself forded the river, followed by five companies of troops. Taking a small party, he began to advance on Longarone. Stumbling into a street barricade manned by Italian machine gunners, Rommel ordered a temporary retreat, and now the Italians began running after him. It was a tricky situation: there were some 10,000 Italian troops in Longarone, so Rommel was vastly outnumbered. In fact, he had only twenty-five men with him at that moment, and when the Italian officers saw how puny Rommel’s force was, they confidently or- dered their men to open fire. All Rommel’s force here was wounded or captured, but he himself managed to slip away into the shadows. He reassembled his Abteilung just south of Longarone in the darkness. Six more times the Italian mob tried to overrun him, but six times Rommel’s machine gunners sent them running for cover back into the town. To prevent the enemy from outflanking him in the darkness, Rommel set fire to the houses along the road, illuminating the battlefield. By midnight, reinforcements began arriving from Major Sproesser and from an Austrian division. In his later published account of the battle of Longarone, Rommel romanticized. There he described how he himself had swum the icy Piave at the head of his Abteilung. Yet there can be no doubt of his own physical courage in battle, even if these 1917 victories over the Italians were purchased relatively cheaply. In the ten-day battle ending in the Italians’ humiliating defeat at Longarone, Sproesser’s entire battalion lost only thirteen enlisted men and one officer (he fell off a mountain). At Longarone, Rommel captured 8,000 Italians in one day. Not for another quarter century would Rommel really meet his match. One month later, the Kaiser gave him the tribute he ached for, the matchless Pour le Mérite. The citation said it was for breaching the Kolovrat line, storming Mataiur and capturing Longarone. Rommel preferred to attribute it to Mataiur alone unless he was in Italian company; then he took a certain sly pleas- ure in saying he won it at Longarone. Rommel was never diplomatic. Fame never found anyone who was waiting to be found. Even the Marine Corps is lost. (D)iversity can make even the best of us throw away our brain and smear our good name. The Marine Corps Recruiting Command continues to answer the call from Gen. James Amos, commandant of the Marine Corps, to build a Marine Corps that reflects “the face of the nation.” Over the course of the past fiscal year, MCRC has recruited its most diverse group of officers in a decade. The fun part would be to interview the officer recruiters to see who they were ordered to "operationalize (D)iversity recruiting" - but we've covered that racist activity before. For now though, let's just pick apart the last bit. By "look" he means the most superficial thing - facial features and skin tone. Even a little deeper than that - it really means what block they check so the metrics match. That is why we have blond haired blue eyed "Hispanics" and predominately Caucasian "African Americans". Worse than all of the above, LtCol McMillon is in effect saying that the Marine Corps enlisted ranks are flush with Marines who are racist to the core - minority Marines who will only follow orders and perform if they have someone in their Chain of Command that "looks" like them. The secondary implication is, of course, that a Hispanic will respond to a Hispanic officer better than an African American officer or Asian or Caucasian officer and so on if you want to mix your racial groupings. Really? So, show me where in a decade of combat we have any evidence of that? Not only does that fly in the face of all military history - it is transparent in its cant like quality. Mumbling Party approved language like some mid-20th Century Soviet Political Officer. UPDATE: I don't know what to say. I am, in a word, beyond gobsmacked if there is such a thing - that word. Terry reminds me that I need to read Lex every day. If you need any reason more to understand the cancer that is the (D)iversity Cult .... Behold! A former Marine who was awarded the Medal of Honor bowed out of his quest Tuesday to join the New York City Fire Department after a federal judge denied his request to extend the application deadline for all aspiring firefighters — not just him. The judge had been willing to grant a 24-hour application extension for Sgt. Dakota Meyer, who saved the lives of 36 people during an ambush in Afghanistan two years ago. Meyer missed the FDNY’s application deadline because he was busy with official Medal of Honor commitments and ceremonies, said Keith Sullivan, his attorney. That didn’t seem fair to Meyer, who charged five times in a Humvee into heavy gunfire in the darkness of an Afghanistan valley to rescue comrades under attack from Taliban insurgents. Lex puts it quite well. So, the city of New York loses out on a chance to add a hero to its ranks. But the risk to diversity, thank God, has been averted. Of course - most want 8-inches instead, with a few Marines dreaming of the joys of a 16-inch - but if you only have 3 or 5 inches to work with - you've got to make it count. Wait ... that doesn't read right. Oh, nevermind ... see below. Oto Melara unveiled yesterday a family of extended range and guided 76mm projectiles it is developing for the popular 76/62 naval gun system. The new Vulcano 76 round transforms this classic naval weapon into a multi-mission weapon system, capable of handling surface targets at sea and on land. The weapon addresses new operational requirements evolving from modern littoral warfare missions; as reflected in the Second lebanon War (2006) and the Libyan campaign in 2011. In addition to engaging surface targets, the system can handle air-defense as well as fulfil classic naval gunnery support (NGS). As a guided projectile, the fin-stabilized Vulcano 76 will offer autonomous GPS/INS guidance, practically doubling the range of current 76/62 systems. When engaging fixed land based targets or surface targets at sea, the new projectile enables even small vessels to engage targets with high precision, from ranges exceeding 40 km, at a high rate of fire. The new capability will enable small littoral combat ships, frigates or gunboats to dominate a wide coastal area from a stand-off distance, out of the range of contemporary medium range anti-ship coastal defense missiles, rockets or artillery. Vulcano 76 will use a common guided or unguided projectiles, fitted with a new multi-modal RF microwave fuse offering altimetric (airburst), proximity (against aerial, naval and surface targets) or delayed impact (penetrating) and self-destruct modes. Employing the optimal fusing method enables the five kilogram pre-fragmented warhead made of tungsten-steel compound to provide twice the lethality of existing rounds at 80% of the weight. ... The time of flight reaching targets at 40 km is about 120 seconds. Yea .... but not our Littoral Combat Ship - it uses the unsupported 57mm. Something beats nothing. The French, as we saw, made good work in Libya with their 100mm and the Brits with their 4.5" ... so ... the gun continues to prove its utility. Improvements to proven systems; what a radical concept. 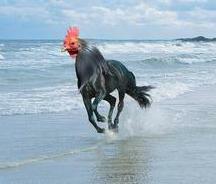 Hey ... what about our ERGM. Ummmm, errrr .... oh, yea. Sometimes it is helpful to look outside the Navy's number just to be reminded that the Diversity Commissariat is quite busy - and there are others who are pushing back. Where is EVERYONE's appreciation month? What? They don't appreciate everyone? Actually, the Diversity Bullies don't - but that is a subject just not spoken in polite company. In any event - whites (an artificial construct that lumps Arabs of Yemen and Sami of Norway in to the same "ethnic" group) shouldn't have their own little patronizing month - and neither should anyone else. It is insulting in the extreme - especially for those who are mixed race. If we must classify everyone like the AKC does dogs, can't we at least have an "American Appreciation Month" for us/them that really don't have a race and wish to identify themselves as what the world sees us/them as, Americans? The Diversity Bullies are not really interested in equality, recognition of diversity, or inclusion - no. At their core they are little more than small minded, sectarians who, through their actions, judge people no better than the KKK. They are either anti-white racists (yes, I wrote that), whites full of ethnic self-hate, or just shameless politicians trying to curry favor by trading their integrity for a few shekels. Anyone who makes an extra effort to discriminate on the basis of race, creed, color, or national origin - which is what the Navy's Diversity policy does - is part of the problem, not the solution. ... as are all actions that try to break our military - an institution that must have unity to excel in combat - in to sectarian bits for socio-political Cultural Marxist reasons. To paraphrase; (D)iversity Diktat is as nastily racist as it is false. Bigots - not my favorite; and another Thursday passes. Want to know what passes for the higher-level history education now days? Read the whole H-Diplo Roundtable Review, Volume XIII, No. 1 (2011), 1 September 2011 on their review of John Dower's book, Cultures of War: Pearl Harbor / Hiroshima / 9-11 / Iraq . The Onion couldn't do it better. These are the quotes from the best minds from Columbia to MIT. As usual, their prose is a bit opaque - but gut it out for the greater good. Dower argues that whether ruled by monarchs or “imperial presidents,” such states--and the U.S. most notably--cannot qualify as genuine democracies. ... the rhetoric of empire cannot hide the American rulers’ historical hostility to democracy. They manifested their hatred of democracy for others under the guise of “benevolent assimilation” in the era of McKinley and Theodore Roosevelt, when U.S. troops killed “at least two hundred thousand Filipino civilians in the Philippines war” (p. 82), and they do the same in our own time--the era of “benevolent global hegemony,” when our armed forces slaughter even greater numbers of civilians. ... it is impossible to explain the behavior of Japan’s top leaders in the 1930s and America’s senior leaders today without taking account of their “failures of imagination,” and “absence of transparency, accountability and plain common sense” (p. xxxii). This is as true for George W. Bush and his small, six-person, inner circle as it was for Japan’s collective decision makers grouped around Emperor Hirohito. “American veneration of force,” self-righteousness, and arrogance are a third group of themes running through Dower’s book. ... once in Iraq, over-confidence and arrogance led them to discount the many “red flags” (p. 121) that went up, suggesting that they had not thought through the aftermath of their military intervention and had no exit plan. Irrationality, I would add, was inherent not only in their ideological passions but in every action they took in violation of Kant’s categorical imperative maxim. ... a major failure of imagination, on a par with Japan’s failure to grasp what Pearl Harbor would look like from the American viewpoint or how quickly the enormous war potential of the U.S. could be brought to bear against their forces. Racism on both sides led to denigration of the enemy. If you wonder who such smart people can see the world so wrong - a lot of it has to do with their poor eduction at our "best" institutions. We have come very close to destroying the Navy Brand as a marketing person would understand it. Look at the video below, and if you know what I mean you will only see one person who in one second says, "Navy." Skipper - I need to buy you a beer. The other guys? Who knew the Battlestar Galactica convention was going on? Most importantly, I think all military officers MUST consider doing the same. Forget the citizenship thing; I'm in. How much do you hate PowerPoint? Probably not as much as Matthias Poehm. He’s founded an entire political party dedicated solely to the eradication of the dreaded (but oh-so-user-friendly) presentation software, the Christian Science Monitor reports. The Anti-PowerPoint Party, or APPP, held its first meeting earlier this week, with the goal of “decreasing the number of boring presentations worldwide.” If they can collect 100,000 signatures, they can call a public referendum to ban the program. Where does one start? Well - let's do that with a quote from last week from Admiral Mullen, USN. "We all have to recognize that we have to cinch up our belts, and we haven't done that in a decade," he said of military spending. I want you to read the below email with a pen an paper ready (Marines may want to use a pencil). Add up what has already been spent on the professional Onanism, and then add in the not-too-subtle D&G from N41. For those who have deployed in theater recently and could not get the Navy supply system to do even basic uniform support to the point you had to borrow from others or have family purchase and mail to you (yes me); ponder that money. Also ponder the upper pay-grade cost per hour in the To:/CC: lines. Now that we can call the Pentagon our "home," and to brand our E-Ring passageway with the symbols and displays that capture the essence of our contributions to the Navy and Department of Defense, CAPT Ron [redacted] has officially requested permission (via DON/AA-Mr. John [redacted]) to the DoN Corridor Committee to install three exhibits along the E-Ring bulkhead. Because the DoN Corridor Committee is new and still trying to determine how they plan to proceed, there is a moratorium on all new displays/exhibits (previous approved requests were grandfathered). However, since the request has been submitted, upon approval, we can proceed with due diligence to install and present quality themes that highlight our mission. There are 2 display firms that do 90% of the business in the Pentagon, Smart Design and Blair. The average display costs approximately $250,000-$300,000 (i.e., "Golden 13"-the thirteen African American enlisted men who became the first African American commissioned and warrant officers in the United States Navy). There is a low-cost alternative being considered by some Navy offices to use the Naval History & Heritage Command (approximately $10,000-$15,000). The Command will do this on a collateral basis (not their full-time focus), and the displays are historical in nature with demos about to be installed within the vicinity of the VCNO/ACMC (prototype; others will determine if that's the low-cost approach they may prefer to consider). FYI (for reference): The two Navy Supply Corps displays (grandfathered) on 4th deck, Corridor 4, cost approximately $75,000 each, with a third display in progress (total: ~$225,000). Smart Design did the first two displays and were "awesome" in their support and process. Considering the cost and investment in the venture, I would like to propose CAPT [redacted] (Chair) and CDR [redacted] (N41 AO) work with a select group of N4_Division volunteers (NTE ~2 per Division) that can discuss an N4 theme and reference current Pentagon displays to synergize a consistent design that expresses naval logistics excellence. An important distinction in exhibits is enduring (i.e., Navy Supply-static in nature) vs. dynamic (i.e., Navy Medal of Honor awardees at 4th Deck A-Ring Apex-fluid, glass encased bulletin board for rotating/revising images such as the annual Admiral Stan Arthur award recipients, NLI/JLE initiatives/success stories, and environmental/energy news/initiatives). I'm sure N45 and their Public Affairs staff would have some amazing ideas in mind. If you concur, please submit the names of your volunteers to CAPT [redacted] and CDR [redacted] NLT COB, Fri., 02Sep. CAPT [redacted]'s intention is to present an initial recommendation (pending future vendor proposals) to DIVDIRs NLT COB Fri., 30Sep. Once the request is approved by the DoN Corridor Committee, and an N4_general theme/medium is determined and funding level is confirmed, volunteer representatives from the Divisions will coordinate with CDR [redacted] and the vendor (preference for Smart Design since they already bring experience/consistency from Navy Supply displays) to design and install the display. All else being equal (pending CRA) and moratorium is lifted, the target date for installation is NLT Fri., 16Dec. Please direct any questions or concerns you may have to CAPT [redacted]. Don't get me wrong - I like nice displays ... but ... do you know how much work a taxpayer has to do in order to pay for this? How many taxpayers it takes? Money that does not go to their children so it can go to Uncle Sam instead? Have we pondered how many cars you can buy for that? You can get a top-line Fiat 500 (natch) for $25,000. Add it up. As a side note - this was going to be posted a couple of weeks ago, but I held back to get comment from the N41 shop. On the advice of a PAO I have the greatest respect for and is a true professional, but sadly this shop is out of his mandate, I asked who was the right person to go through. He gave me the right person's POC info, so I tried to be nice and ask for comment or additional information. Oops. I tried the LCDR at OI-31, but she punted me to the LT on duty at the Navy News Desk Action Officer, Navy Office of Information in the Pentagon. After an initial "How can I help you..." email - no response to any of my questions. Zilch. So, that just reinforces my opinion of the PAO system in general in the Navy. Shame, I have met some good ones - but the problem is deep and the quality is spotty. My bust - I should have known better. I feel stupid in that I let them delay a story. My fault. Next time I'll just blind side you N41 types. BTW - I am still waiting for my fleece, second set of DCUs, and ... whatever. This is a full quote of the D&G from the CNO that came out recently. I'm sorry, but I have absolutely nothing to quibble with here. Admiral Greenert, this is a solid piece of work, and is all the Fleet needs. Deter aggression and, if deterrence fails, win our Nation’s wars. Employ the global reach and persistent presence of forward-stationed and rotational forces to secure the Nation from direct attack, assure Joint operational access and retain global freedom of action. With global partners, protect the maritime freedom that is the basis for global prosperity. Foster and sustain cooperative relationships with an expanding set of allies and international partners to enhance global security. The U.S. Navy will remain critical to our national security and our economic prosperity. The Navy will continue to be at the front line of our nation’s efforts in war and peace with a proud heritage of success in battle on, above, and below the sea. The Navy will continue protecting the interconnected systems of trade, information, and security that underpin American prosperity. Operating forward across the globe, the Navy will provide the nation offshore options to win today and advance our interests in an era of uncertainty. We will deliver credible capability for deterrence, sea control, and power projection to deter or contain conflict and fight and win wars. As ground forces draw down in the Middle East, the Navy will continue to deter aggression and reassure our partners – we will have the watch. Ready Sailors and Civilians will remain the source of the Navy’s warfighting capability. Our people will be diverse in experience, background and ideas; personally and professionally ready; and proficient in the operation of their weapons and systems. Our Sailors and Civilians will continue a two-century tradition of warfighting excellence, adaptation, and resilience. Our character and our actions will remain guided by our commitment to the nation and to each other as part of one Navy team. Use new technologies and operating concepts to sharpen our warfighting advantage against evolving threats. Operate forward at strategic maritime crossroads. Sustain our fleet capability through effective maintenance, timely modernization, and sustained production of proven ships and aircraft. Provide our Sailors confidence in their equipment and in their own skills. Over the next 10 to 15 years, the Navy will evolve and remain the preeminent maritime force. The reach and effectiveness of ships and aircraft will be greatly expanded through new and updated weapons, unmanned systems, sensors, and increased power. The Air-Sea Battle concept will be implemented to sustain U.S. freedom of action and Joint Assured Access. Unmanned systems in the air and water will employ greater autonomy and be fully integrated with their manned counterparts. The Navy will continue to dominate the undersea domain using a network of sensors and platforms - with expanded reach and persistence from unmanned autonomous systems. Cyberspace will be operationalized with capabilities that span the electromagnetic spectrum – providing superior awareness and control when and where we need it. Our forces will operate forward in new and flexible ways with access to strategic maritime crossroads. Our posture will be focused and improved using a combination of rotational deployments, forward bases, temporary and austere facilities and partner nation ports. Our forward presence will build on and strengthen our partnerships and alliances where sea lanes, resources, and vital U.S. interests intersect. Our primary mission is warfighting. All our efforts to improve capabilities, develop people, and structure our organizations should be grounded in this fundamental responsibility. People are the Navy’s foundation. We have a professional and moral obligation to uphold a covenant with Sailors, Civilians and their families – to ably lead, equip, train and motivate. Our approach should be Joint and combined when possible. However, we own the sea, and must also be able to operate independently when necessary. Our primary Joint partner is the U.S. Marine Corps. We must continue to evolve how we will operate and fight as expeditionary warfare partners. At sea and ashore, we must be ready to part with Navy roles, programs and traditions if they are not integral to our future vision or a core element of our mission. We must ensure today’s force is ready for its assigned missions. Maintaining ships and aircraft to their expected service lives is an essential contribution to fleet capacity. Our Navy Ethos defines us and describes the standard for character and behavior. We must clearly and directly communicate our intent and expectations both within and outside the Navy. I believe in the “Charge of Command.” We will train and empower our leaders with authorities commensurate with their responsibilities. You can get the "suitable from framing PDF via download here. RMKS/1. IT HAS BEEN THE GREATEST PRIVILEGE AND HIGHEST HONOR TO SERVE AS YOUR CHIEF OF NAVAL OPERATIONS. YOUR TALENT, DEDICATION,AND INITIATIVE AS UNITED STATES SAILORS DURING THIS TIME OF WAR AND CHANGE HAVE MADE OUR NAVY THE MOST CAPABLE AND READY NAVAL FORCE THE WORLD HAS EVER KNOWN. I COULD NOT BE MORE PROUD OF WHAT YOU DO AND HOW EXCEPTIONALLY WELL YOU DO IT. 2. OVER THE LAST FOUR YEARS AT SEA, IN THE AIR, ON THE GROUND, AND IN CYBERSPACE YOU HAVE MADE A DIFFERENCE. MORE THAN 40 PERCENT OF OUR SHIPS AND MORE THAN 50,000 SAILORS ARE DEPLOYED TODAY, INCLUDING 12,000 SAILORS ON THE GROUND IN CENTRAL COMMAND AND MORE THAN 8,000 INDIVIDUAL AUGMENTEES AROUND THE WORLD. YOU KNOW THIS FIRSTHAND BECAUSE YOU EXPERIENCE THE STEADY PACE OF OPERATIONS OUR NAVY HAS SUSTAINED OVER THE LAST DECADE FROM THE FRONT LINES IN IRAQ AND AFGHANISTAN TO THE SEA LINES OF COMMUNICATION IN THE PACIFIC AND INDIAN OCEANS. YOU ARE THE REAL CAPABILITY OF OUR NAVY. YOU ARE IN EVERY OCEAN AND ON EVERY CONTINENT. YOU TAKE THE FIGHT TO THOSE WHO WISH US HARM. YOU PREVAIL AGAINST PIRATES, TRAFFICKERS, AND TERRORISTS. YOU DELIVER VITAL HUMANITARIAN ASSISTANCE IN THE WAKE OF DISASTERS ON A MOMENT'S NOTICE WHEREVER NEEDED. YOU PREVENT CONFLICT AND DEMONSTRATE U.S. COMMITMENT TO ALLIES AND PARTNERS THROUGH YOUR PERSISTENT, CREDIBLE FORWARD PRESENCE AND VARIED MARITIME OPERATIONS. YOU EPITOMIZE FLEXIBILITY AND AGILITY AS OUR NAVY RESPONDS RAPIDLY AND INNOVATIVELY TO EMERGING CRISES AND UNEXPECTED DEMANDS. 3. THESE ACHIEVEMENTS HAVE COME WITH A PRICE. EVERY DAY, I AM INSPIRED BY THE TREMENDOUS SACRIFICES YOU AND YOUR FAMILIES MAKE FOR OUR NAVY AND FOR OUR NATION. THANK YOU FOR SERVING. YOU ARE THE FINEST SAILORS WHO HAVE EVER SAILED. 4. I AM RELIEVED TODAY BY ADMIRAL JONATHAN GREENERT. HE IS AN EXPERIENCED LEADER AND OPERATOR WHOSE SOUND JUDGMENT AND DEVOTION TO OUR NAVY WILL KEEP US READY, CAPABLE, AND DOMINANT WELL INTO THE FUTURE. OUR NAVY IS IN EXCELLENT HANDS. 5. ELLEN AND I WISH EACH OF YOU AND YOUR FAMILIES FAIR WINDS AND FOLLOWING SEAS. I AM PROUD TO HAVE SERVED WITH YOU. ... and we have a new CNO. RMKS/1. AT 1055L TODAY, ADMIRAL JONATHAN GREENERT RELIEVED ADMIRAL GARY ROUGHEAD AS THE CHIEF OF NAVAL OPERATIONS. 2. ALL CURRENT ORDERS AND DIRECTIVES REMAIN IN EFFECT UNTIL FURTHER NOTICE. RMKS/1. TODAY, I AM HONORED TO BECOME YOUR 30TH CHIEF OF NAVAL OPERATIONS. ADMIRAL ROUGHEAD TURNED OVER TO ME THE GREATEST NAVY IN THE WORLD. 2. I AM THE SON OF A STEEL WORKER FROM BUTLER, PA. GROWING UP WITH FOUR SISTERS AND MY BROTHER, MY PARENTS TAUGHT ME AT AN EARLY AGE THE VALUE OF HARD WORK, PERSEVERANCE, AND INTEGRITY. THE OPPORTUNITIES THE NAVY GAVE ME OVER THESE PAST 36 YEARS PUT ME ON A JOURNEY FROM WESTERN PENNSYLVANIA TO SERVING AS CHIEF OF NAVAL OPERATIONS TODAY. I CONSIDER MYSELF AN EXAMPLE OF THE TREMENDOUS OPPORTUNITIES OUR NAVY AFFORDS EACH OF US EVERY DAY. A. WARFIGHTING FIRST: WARFIGHTING IS AT THE CORE OF OUR EXISTENCE. WE MUST MAINTAIN OUR ABILITY TO FIGHT AND WIN. B. OPERATE FORWARD: WE ARE MOST EFFECTIVE OPERATING FORWARD AROUND THE WORLD, ENSURING ACCESS TO THE MARITIME CROSSROADS TO ENSURE FREEDOM OF MANEUVER AND ECONOMIC PROSPERITY. C. BE READY: WE WILL BE READY. OUR SAILORS WILL BE TRAINED, OUR SUBMARINES, SHIPS, AND AIRCRAFT WILL BE MAINTAINED, AND OUR SHORE COMMANDS WILL BE ENABLED TO SUPPORT WHAT YOU NEED TO DO YOUR JOB. WE WILL BE JUDICIOUS WITH OUR RESOURCES, AND OUR SAILORS' AND CIVILIANS' TIME, WHILE PREPARING TO EXECUTE ASSIGNED MISSIONS. 4. I AM HONORED TO BE YOUR CHIEF OF NAVAL OPERATIONS. DRAWING UPON OVER TWO CENTURIES OF HERITAGE AND TRADITION, I TRUST THAT, WHEN CALLED UPON, YOU WILL PERFORM SUPERBLY. YOU EXEMPLIFY THE HIGHEST STANDARDS OF SERVICE TO OUR NATION. RMKS/1. TODAY, I RELIEVED ADMIRAL GARY ROUGHEAD AS CHIEF OF NAVAL OPERATIONS. ADMIRAL ROUGHEAD HAS STOOD AT THE HELM OF OUR GREAT NAVY FOR FOUR CHALLENGING YEARS. UNDER HIS STEADFAST LEADERSHIP, THE U.S. NAVY HAS EXCELLED IN MAJOR COMBAT OPERATIONS IN THE MIDDLE EAST, SOUTHWEST ASIA, AND NORTH AFRICA. HE HAS LED AND ENABLED OUR NAVY TO TAKE THE FIGHT AGAINST EXTREMISTS FORWARD, AWAY FROM OUR SHORES, AND DETER OUR ENEMIES FROM ATTACKING OUR HOMELAND. AT THE SAME TIME, HE BALANCED OUR EFFORTS IN SUPPORTING TWO WARS WITH NUMEROUS HUMANITARIAN ASSISTANCE AND DISASTER RELIEF OPERATIONS ACROSS THE GLOBE IN ORDER TO ASSIST OUR PARTNERS AND ALLIES IN THEIR TIME OF NEED. THROUGH HIS SAGE WISDOM, VISION, AND GUIDANCE, OUR NAVY HAS GROWN IN CAPABILITY AND EXPANDED GLOBAL MARITIME PARTNERSHIP. WE ARE ON A GOOD COURSE TO MEET THE CHALLENGES LOOMING ON THE HORIZON. I SALUTE ADMIRAL ROUGHEAD AND HIS WIFE ELLEN FOR THEIR STEADFAST DEVOTION AND SELFLESS SERVICE TO OUR NAVY AND OUR NAVY FAMILIES FOR THE LAST 38 YEARS. 2. I AM HONORED TO BE AFFORDED THE OPPORTUNITY TO LEAD THE WORLD'S MOST CAPABLE NAVY AT A CROSSROADS IN OUR NATION'S HISTORY. AS OUR COUNTRY ADJUSTS TO A NEW STRATEGIC PARADIGM IN THE COMING YEARS, WE WILL ADAPT TO CHANGE AND DEFEND NATIONAL SECURITY INTERESTS WITH THE SAME SPIRIT AND WARRIOR ETHOS THAT HAVE BEEN EMBEDDED WITHIN THE VERY FABRIC OF OUR CULTURE AND HERITAGE SINCE OUR FOUNDING. 3. OUR NAVY'S ABILITY TO DEFEND NATIONAL INTERESTS HAS ALWAYS DEPENDED ON THE INITIATIVE AND RESOURCEFULNESS OF OUR COMMANDING OFFICERS. COMMAND IS ONE OF THE CORNERSTONES OF THE VERY FOUNDATION UPON WHICH OUR NAVY RESTS. YOU HAVE BEEN ENTRUSTED WITH THE "CHARGE OF COMMAND." YOU WERE SELECTED FOR COMMAND BY SENIOR OFFICERS WHO JUDGED YOU WORTHY, READY AND THE BEST QUALIFIED TO LEAD SAILORS, AND THEY DID SO BASED UPON SUSTAINED SUPERIOR PERFORMANCE OVER THE COURSE OF YOUR RESPECTIVE CAREERS. TO WHOM MUCH IS GIVEN, MUCH IS EXPECTED. I EXPECT COMMANDING OFFICERS AT ALL LEVELS TO BE FULLY FLUENT IN THE THREE ESSENTIAL PRINCIPLES OF COMMAND - AUTHORITY, RESPONSIBILITY, AND ACCOUNTABILITY. YOU HAVE BEEN PROVIDED WITH THE AUTHORITY COMMENSURATE WITH YOUR RESPONSIBILITY - EXERCISE YOUR AUTHORITY WISELY. WITH RESPONSIBILITY COMES ACCOUNTABILITY. I EXPECT THAT YOU WILL MAINTAIN THE HIGH STANDARDS REQUIRED OF COMMANDING OFFICERS, AND HOLD THE MEMBERS OF YOUR COMMAND TO THE SAME HIGH STANDARDS THAT I HOLD YOU. ACCOUNTABILITY IS BASED ON TRUST. I TRUST IN YOU; YOU MUST BUILD THIS SAME TRUST WITH THE PEOPLE IN YOUR COMMAND. BUILD THIS TRUST THROUGH YOUR PERSONAL INTERACTIONS AND DEMONSTRATE YOUR CHARACTER THROUGH PROFESSIONAL COMPETENCE, GOOD JUDGMENT, FAIRNESS, COMMON SENSE, AND RESPECT, BOTH UP AND DOWN THE CHAIN OF COMMAND. WHEN THIS TRUST AND ACCOUNTABILITY ARE INSTITUTIONALIZED IN THE ROUTINE OF COMMAND, THE RESULT IS OUR COLLECTIVE LONG TERM SUCCESS. FOSTERING A CLIMATE OF TRUST AND ACCOUNTABILITY IS YOUR DUTY AS COMMANDING OFFICERS IN THE UNITED STATES NAVY. DO NOT LET ME DOWN. 4. WE WILL USE THREE MAIN TENETS TO ACHIEVE OUR VISION. THE FIRST TENET, "WARFIGHTING FIRST," MUST BE AT THE VERY CORE OF OUR EXISTENCE. ALL OF OUR EFFORTS TO IMPROVE CAPABILITIES, DEVELOP PEOPLE, AND STRUCTURE OUR ORGANIZATIONS SHOULD BE GROUNDED IN THIS FUNDAMENTAL PRINCIPLE. WHEN CALLED UPON, NAVY AND OUR CLOSEST JOINT PARTNER, THE U.S. MARINE CORPS, WILL DELIVER CREDIBLE COMBAT CAPABILITY TO ASSURE ACCESS, SEA CONTROL, AND POWER PROJECTION IN ORDER TO FIGHT AND WIN OUR NATION'S WARS. 5. OUR SECOND TENET IS "OPERATE FORWARD." OPERATING FORWARD IN THE GLOBAL MARITIME CROSSROADS, THE NAVY PROVIDES THE NATION AND OUR NATIONAL LEADERSHIP WITH OFFSHORE OPTIONS IN ORDER TO DETER, INFLUENCE AND PREVAIL IN ANY CONFLICT WE ENCOUNTER IN TODAY'S UNCERTAIN ENVIRONMENT. OUR FORWARD DEPLOYED POSTURE WILL BE READY AND PERSISTENT, USING A COMBINATION OF ROTATIONAL DEPLOYMENTS, FORWARD BASES, AND COOPERATIVE SECURITY LOCATIONS. OUR FORWARD PRESENCE WILL BUILD ON AND STRENGTHEN OUR PARTNERSHIPS AND ALLIANCES WHERE SEA LANES, RESOURCES, AND VITAL U.S. INTERESTS INTERSECT. 6. OUR THIRD TENET IS "BE READY" TO FACE ANY CHALLENGE. THE IMPORTANCE OF UNIT READINESS (MATERIEL INTEGRITY AND OPERATIONAL PROFICIENCY) IS EMBEDDED AND INCULCATED IN EVERY SAILOR EARLY IN THEIR TRAINING. HOWEVER, WE CANNOT BE A WHOLE NAVY WITHOUT A MOTIVATED, RELEVANT, AND DIVERSE TEAM OF SAILORS, CIVILIANS, AND FAMILIES. THIS LEVEL OF READINESS REQUIRES THAT EACH AND EVERY SAILOR BE PHYSICALLY, MEDICALLY, PSYCHOLOGICALLY, SPIRITUALLY, AND ADMINISTRATIVELY READY TO DEPLOY WORLDWIDE. IN ADDITION TO OUR SAILORS AND CIVILIANS, WE HAVE A RESPONSIBILITY TO OUR NAVY FAMILIES, WHO WE MUST GUIDE AND ASSIST IN HANDLING INCREASINGLY DYNAMIC SCHEDULES, MOUNTING OPERATIONAL STRESS, LONGER SEPARATIONS AND THE POTENTIAL INJURY OR LOSS OF THEIR SAILOR. ACCORDINGLY, FAMILY READINESS IS ALSO A PART OF "BEING READY." WHILE WE HONE OUR INDIVIDUAL, UNIT, AND FAMILY READINESS, WE HAVE TO DEAL WITH DIMINISHING RESOURCES. WE MUST ADOPT AND EMBRACE A CULTURE OF FISCAL RESPONSIBILITY AND JUDICIOUSNESS. WE MUST BE READY AND WILLING TO MAKE ANALYTICALLY SOUND, HARD CHOICES IN THE MONTHS AND YEARS AHEAD. FURTHER, WE MUST ALSO LOOK FOR INNOVATIVE WAYS OF MAINTAINING OUR FORWARD DEPLOYED AND READY POSTURE, WHILE SEEKING EFFICIENCIES AND REDUCING COSTS WHEN WE CAN. 7. I ENTER THE OFFICE OF THE CHIEF OF NAVAL OPERATIONS FULLY AWARE THAT WE HAVE DAUNTING CHALLENGES TODAY AND IN THE FUTURE. I ALSO HAVE A GREAT SENSE OF PRIDE IN YOU AND AM CONFIDENT ABOUT THE FUTURE. OUR RESPONSIBILITY IS TO PROVIDE A NAVY THAT IS READY TO EXECUTE TODAY'S MISSION TODAY, AND TO MEET TOMORROW'S CHALLENGES. I AM CONFIDENT YOU WILL CONTINUE TO RISE TO THE OCCASION - AS YOUR PREDECESSORS HAVE DONE SINCE OUR NATION'S FOUNDING - AND LEAD OUR SAILORS TO SUCCESS! - Admiral Roughead, where have you been? What a great outgoing message though. Spot on, I don't think I would change a single thing. - Admiral Greenert. Para 2 is of very bad form. No one cares that your were associated with steel workers. It isn't about you or your personal narrative - especially in this context. Think your story is significant? Take a number. Let us speak of this no longer. - Para 3 is outstanding. "ORGANIZE, TRAIN, AND EQUIP" is essential as it reminds everyone what your charter is as CNO. Nice message - short and to the point. - That is a great message. I have three takeaways. - First: "THREE ESSENTIAL PRINCIPLES OF COMMAND - AUTHORITY, RESPONSIBILITY, AND ACCOUNTABILITY." Yes, and I hope for the last of those three we will see not just to the CDR/CAPT level - but higher. - Second: if it is important, you need to repeat it: "TRUST." We talked about it last week, and I am exceptionally happy to see you emphasize it. Often times we talk too much about "loyalty" and not enough about "trust." Nice. - Third: "WARFIGHTING FIRST" - "OPERATE FORWARD" - "BE READY": those are a top three that everyone can remember, support, and infuse in to their plan of the day. I like it; a lot. I wish you and our Navy the best possible next few years with you as CNO. Because regardless of how much they achieve and how talented they are - their career always feels like this to them. Canada - the fruits of a safe and secure border. For WWII and aviaition fans - this Sunday from 5-6pm EST is a Midrats you do not want to miss! Join EagleOne me with a returning guest to Midrats, author David Sears for the full hour to discuss his latest book, Pacific Air: How Fearless Flyboys, Peerless Aircraft, and Fast Flattops Conquered the Skies in the War with Japan. I'm ponder'n it over at USNIBlog. An American made helo of the German Army being loaded on to an Antonov An-124 in AFG. If you just came out of a Cold War coma - you would think you were in a parallel universe. A little different FbF this week. I want to take a moment to give a nod to our little brother up North - the Canadians. We fought two wars against them, then created the largest demilitarized border in the world with freshwater seas free of warships. We fought side-by-side often since. When it was time for the West to stand, there were few nations that went in relatively caveat free and ready to go; Great Britain, Canada, The Netherlands, Denmark, Estonia and a few Special Operations force contributions by Norway, New Zealand and a few others. Those who went North, West, and Center - only partial credit. Some, like the Poles, did come in stronger later - but when it counted in the beginning; Canada was there. They have a lesson for us - not just in their economy - but in what they learned from their experience in Afghanistan. I invite you to poke around a bit at The National Post. It is a little too much on the "all vets are damaged, let's have a good cry" POV for me - but it is what it is. Canada leaves the Kandahar mission with a reputation for having the best small army in the world. Canadian soldiers are respected around the globe for their battle-hardened professionalism, innovative application of counterinsurgency doctrine and holding their nerve in Kandahar, while other NATO allies cowered on heavily fortified bases munching lobster instead of fighting insurgents. The Americans, who lead the mission, have noticed: Jon Vance, a Canadian general, was entrusted to command thousands of American troops when the U.S. surged into Kandahar last summer. 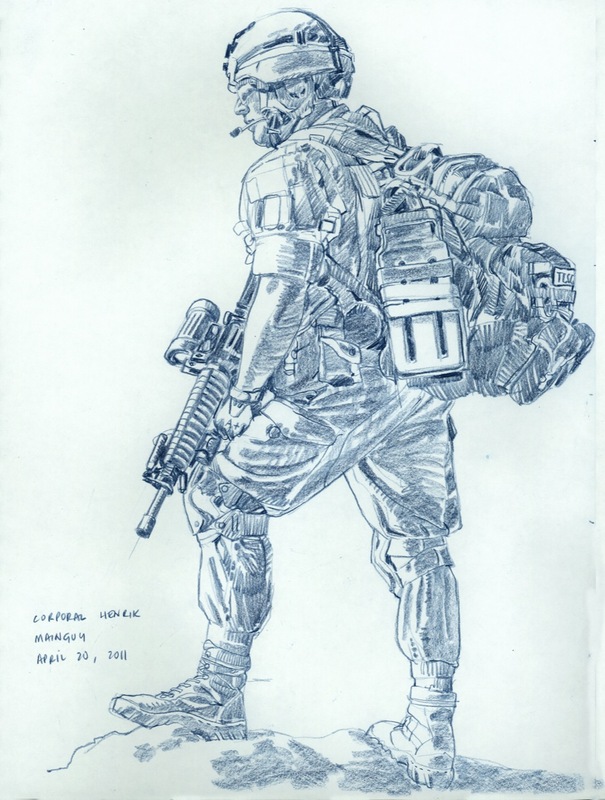 Canadian soldiers now experience the alien sensation of being on the receiving end of allies’ envious glances, coveting Canadian equipment — top of the line, brand new kit bought for the mission. No more making due with duct tape and borrowing from big brother America. In short: We’ve come a long way, baby. The Canadian Forces are back. The army, especially, is a far cry from what it was when Canada sent troops to war nearly a decade ago. As Canada entered the war, experts warned the Canadian military was on the brink of collapse. They predicted that ancient equipment, anemic spending and the bleeding of experienced personnel would produce a exponential and nearly irreversible decline. Canadian troops deployed to Afghanistan wearing bright green camouflage poorly suited Kandahar’s ubiquitous brown dust. Ill-equipped soldiers were forced to drive around in open-air Iltis jeeps that most Canadians wouldn’t feel safe in on a major highway, let alone around a war zone. 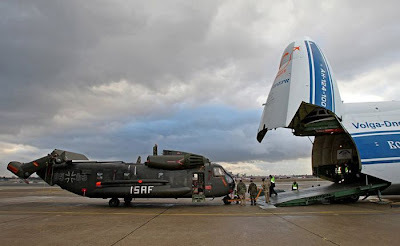 Strategic airlift capability, long written off as an extravagant expense by previous governments, suddenly became an obvious necessity. Deep cutbacks during the Chrétien years had left us unable to live up to our international obligations and, worse, the expectations we held as a country convinced it always punched above its weight. The cost of these cuts — disarmament by neglect — resulted in an increased risk to our soldiers and decreased operational effectiveness on the ground in Kandahar. We can’t forget that, or accept arguments suggesting that the Canadian Forces no longer need the public’s support or continuing modernization. Even in these times of budgetary pressure, the one thing that we truly cannot afford is to forget the lessons learned in Kandahar. Nickel and diming ourselves into another decade of darkness will exact too high a price: the blood of Canadian soldiers in future conflicts. Putting the military on the back burner means death on the battlefield — a cost no Canadian or Canadian government should be willing to pay. As we enter our own arguments about budgets - we should accept the wisdom of our Canadian friends - and thank them for their work in AFG. This week saw the two most senior Admirals make a cringe-enducing departure from our Navy. First out of the box was Admiral Roughead. I understand a few days before FRI AM you have a few things to do ... but really; this is how you do it? When I first received a heads-up about this - I had to tap in to additional sources - all confirmed. This week, Midshipmen were told they couldn't use Stribling to go to class, they must keep their blinds pulled, and not be seen or heard as Roughead makes a farewell tour of USNA for a few days (MIDN source for the pic on the right; at least they are having fun with it). If Admiral Roughead wanted to confirm the worse speculation about him among the MIDN - well - he just achieved his accountability metric on this account. Speaking at Alumni Hall the other night as part of the Forrestal Lecture Series, there are a couple of things that if I were a MIDN would make my head tilt a tad. He said that five years out of the Naval Academy, he took command of the gasoline tanker USS Noxubee. Months later, he let the ship strike a buoy. 1. As CNO and before, ADM Mullen was part of the leadership that removed almost all opportunities for any Junior Officer to command anything - much less at the 5-year mark. Our junior officers are never given the chance, except for a very few, to ever learn early - nope - we'll see you at CDR Command with little time on the bridge/flight hours and then hammer you when you demonstrate your lack of experience in your warfare fundamentals. He has also been at the leadership of a culture that destroy careers at any slight infraction. There is no recovery. The system is on such a zero-defect hair trigger that we have had to reverse decisions to relieve COs ... years late and careers unrecoverable. Pointing those things out doesn't encourage MIDN - it just points out that you left the system worse than you found it. "We in the military must remain apolitical - stay out of politics," Mullen said. "I see too many militaries that are badly politicized - that would be the end of us as a country, and of us as a military." Two things. 1. Though I was on the same side as he was in the DADT debate - Admiral Mullen was totally political in the process to the point of questioning people's honor who were opposed to repeal. See that grin on his face to below - that is politics. There are other examples, but I'll stick with that. 2. What does he think the whole-hog effort of his and Roughead's support for the Cultural Marxist socio-political Diversity Industry is? Few things are more political than the intentional support of sectarianism. If they spent half as much effort to supporting shipbuilding programs and maintenance of existing systems - perhaps we would be in better shape. Everyone. Now it gets thicker. 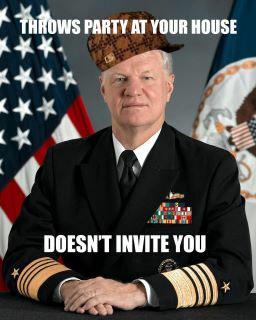 Like most of his generation, the Admiral has very little sense of self-reflection. Who was at the helm for the budget-busting development of DDG-1000, LPD-17, & LCS - creating the lost decade of shipbuilding? Ummmmm, you. Admirals Roughead and Mullen have dedicated the balance of their lives to the service of their nation and did the best they could as they saw it. A nation and its people should always respect that service - I do. That doesn't mean that they should not be held accountable for their actions - just like they hold COs of ships responsible for theirs. Their lack of self-reflection almost requires it. What messages do they send to the MIDN heading out the door? Depends on the MIDN, I presume. The ones I have heard from; not impressed. UPDATE: In case you wonder why the MIDN used that hat on the photoshop. Click here. Best keep up with you'se memes. Always just a couple of goose-steps away from their bad soulmates of the Left, the Fascists and Communists .... when the going gets tough, the Left goes to their core nature. “You know, if a ballplayer threw a game and they get caught, they go to jail. Well, what are we going to do to the Republicans who are throwing the country? Via the Palm Beach Post, you can hear it straight from Palm Beach County Democratic Party fundraising dinner, County Commissioner Burt Aaronson. So much for the new tone. Should we call him "comrade" or just give him the stiff-arm salute? They are incredibly powerful warships, beautiful to boot - modern day Battlecruisers - and would be a wonderful asset to any Navy .... but .... in 2011, what would be in every submariners "Top-3 Targets" list? 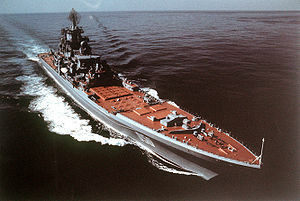 The Russian Defense Ministry is planning to refit three mothballed nuclear-powered Kirov-class missile cruisers in a major boost for the Russian Navy's combat strength, Izvestia newspaper said on Wednesday. As a side-note; I had to deal with Kirov Hull 1 and a Victor III all in one day as an Ensign FWIW. A great Cold War day. Good times ... good times. You thought the logic twists and terms Annapolis goes through are a train wreck (as well document here in the past - look it up) - it could be worse; you could be Peter Kirsanow. Coming to an institution of higher learning near you - if not there already. Staggering racial preferences are in use at the University of Wisconsin–Madison, according to two studies released this week by the Center for Equal Opportunity (CEO). Black or Hispanic undergraduate applicants are 500 times more likely to be admitted than similarly situated white or Asian applicants. Black law-school applicants are 61 times more likely to be admitted than similarly situated white applicants. CEO president and frequent NRO contributor Roger Clegg was shouted down when he appeared on Wisconsin’s campus for a press conference and debate on CEO’s findings. Scores of students mobbed the press conference, shouting insults and, according to Doubletree Hotel management, knocking hotel staff to the ground. Police had to be summoned. Of course - they cannot compete with facts ... but they sure can emote like champs! As we have discussed before - it is all about meeting metrics. Sad thing is - there are secondary effects that have other metrics. The Chronicle of Higher Education reports that the University of Wisconsin has one of the highest gaps in black-white graduation rates among 293 public universities studied. This shouldn’t be a surprise. Studies presented to the U.S. Commission on Civil Rights show that black law students who are the “beneficiaries” of preferences are two and a half times less likely to graduate than their white comparatives. Not unexpected when the median board scores for black and Hispanic admittees are up to 150 points lower than that for white and Asian admittees. Most of those who dropped out probably would have done just fine if they were .... wait for it .... accepted in to an institution that they were qualified for. Remember - most of the Diversity Industry is all about making other people feel good, not having other people call you nasty names, justify a paycheck, or generally to roll around in the intellectual Meth that is the grievance industry - or score points with someone who fits those reasons. Education, justice, and economic advancement (for students) has nothing to do with it. Europe can change some people. Sometimes, not for the better. ... then you will love SES bloat. Ummmm, yep. Rex just about nails it. There are broader issues in the background story of the Battle of Ganjgal where SGT Dakota Meyer earned his Medal of Honor. What went on in the TOC, CPT Swenson and more. The details of that will come out over time, but there are a larger things at play here worth considering. Mistakes will always take place in war even when you have the right people with the right orders conducting the right mission, and we always have to be careful to not do two things; don't twist the 3,000-mile screwdriver (if you have one), or in hindsight pick every action apart as if you would have unquestionably done something different if you were there. Well, you weren't. You may have, you may have not. What can seem wrong in hindsight can, at the moment, seem very right. That is a simple fact. Things bad will happen in war, bad mistakes of commission or omission will take place, but there are things you can do to mitigate it. That is what I find interesting, trying to identify those eternal things in the background, store them away, and hope that you might prosper from that knowlege in the future if you find yourself in a similar situation. First - let's set the stage. The Battle of Ganjgal too place on 08 SEP 09. General Stan McChrystal just took over command of ISAF/US Forces Afghanistan earlier that summer and had released his report just a few weeks prior. Two weeks before that - he released his Direction & Guidance for Counterinsurgency to the forces in the field. From the UNCLAS version of his D&G, here are some excerpts just so you know what was floating around in the ether. Protecting the people is the mission. ... We will not win simply by killing insurgents. … we must change the way that we think, act, and operate … how we interact with people, how we drive or fly, how we patrol, how we use force … Security will not come from overwhelming firepower…A military force, culturally programmed to respond conventionally (and predictably) to insurgent attacks is akin to the bull that continually charges that matador's cape … an insurgency cannot be defeated by attrition; … The intricate familial, clan, and tribal connections of Afghan society turns "attrition math" on its head. From a conventional standpoint, the killing of two insurgents in a group of ten leaves eight remaining: 10-2=8. From the insurgent standpoint, those two killed were likely related to many others who will want vengeance. If civilian casualties occurred, that number will be much higher. Therefore, the death of two creates more willing recruits: 10 minus 2 equals 20 (or more) rather than 8. This is part of the reason why eight years of individually successful kinetic actions have resulted in more violence. The math works against an attrition mind-set. This is not to say that we should avoid a fight, but to win we need to do much more than simply kill or capture militants. Second, conventional culinary action against insurgents consumes considerable resources with little real return and is likely to alienate the people we are trying to secure. Large scale operations to kill or capture militants carry a significant risk of causing civilian casualties and collateral damage. If civilians die in a firefight, it does not matter who shot them - we still failed to protect them from harm. Destroying a home or property jeopardizes the livelihood of an entire family - and creates more insurgents. We sow the seeds of our own demise. ... and so it goes for seven pages. Official investigations point in other directions than the above or the JUL09 Tactical Directive, but having been there eight months earlier under the previous tactical directive - at least my experience is that it is sewn in to everything you do - especially from the Staff level. I do not discount its impact at all. As ISAF is/was a NATO operation - there was a constant background noise that American forces were killing too much; too quick to use indirect fire; too disruptive. The surge we started in late 08 was just getting heft and moving forward - and the US still had not fully taken back the keys from NATO. At the exact time Ganjgal took place, the entire ISAF leadership was soaking in the reaction to the Kunduz airstrike and all the gnashing of teeth and rending of clothes that went with it. Remember the context of the time. New Commander. New focus. The new Commander put out his guidance - a slight modification of General McKiernan's "Shape Clear Hold Build" - and the forces in the field were in the process of digesting them. Read the D&G in full as linked to above, then read the various reports of the Battle of Ganjgal - and the disconnect is clear on what the theory was - and what the reality of the facts on the ground were. The coalition forces were taking increasing fire and could observe women and children shuttling fresh ammunition to Taliban fighting positions. When broad theories meet narrow facts - that is where cracks develop and gaps are created where lives fall in to. The path from think-tank to General's Desk to Staff back to General's Desk to the field is one well worn. When it results in D&G/ROE you can rough out a general matrix to tell you what is going to happen at the element and unit level. Many problems can be minimized in the profession of arms by following the basics of Vince Lombardi Leadership 101 - keep it simple, keep it short. If your D&G sounds like the executive summary to a PhD dissertation, you're doing it wrong. If you are writing for the parlors of Georgetown and the salons of Europe but are delivering to the Strategic Corporal, you're doing it wrong. 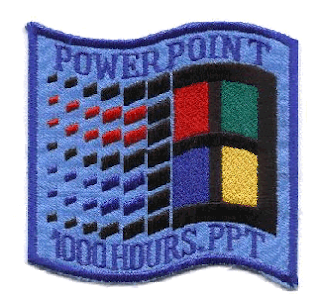 With that set, here is the rough cocktail-napkin matrix of the interplay between Operational D&G, Tactical Leadership in the TOC (Tactical Operations Center), and Unit Level Leadership in contact with the enemy. --- Unit Level Leaders have room to make decisions based on their judgement and the facts at hand. Short OODA loop as the unanticipated happens (as it always does). --- Judgement is well demonstrated and reflected in execution. --- Few questions coming up from down the chain, lots of information coming up from down the chain. --- Core Principals reinforce decisions. Things happen as reasonably expected. --- Orders seem to need constant repeating. OODA Loop is just an Oooooooo. --- Unit Level Leaders seem to want to be told what to do or ask questions that are easily answered with a quick reading of the D&G. --- More questions coming up from down the chain, less information coming up from down the chain. Initiative discouraged; approval seeking encouraged. --- Core Principals seem to be missing. Things happen that make so sense related to the orders given. --- Potential problems at the unit level are identified and planned responses are prepared to mitigate impact. OODA Loop extended, but functioning. --- Unit Level Leaders understand the "white space" gaps and are confident of their support by Tactical Leadership if in extremis. --- Challenges made and requests for modifications/clarifications come up from down the chain; Tactical Leadership responds based on Core Principals. Communication between levels short, decisive. --- Conflicting requirements are resolved quickly based on Core Principals, judgement, and character of leadership. Deviations are reported as needed after decisions are made. --- Orders are seen from a bureaucratic vice military point of view. OODA loop is too long or non-existent. Making no decision is seen as decision making. "Observe" is replaced by "Comply." --- Unit Level Leaders do not understand the "white space" gaps as they do not know they exist as Tactical Leadership has never thought out or wargamed the implications of higher D&G. --- Tactical Leadership is self-focused, judgement is supplanted by reverence to specific words in D&G. A palatable sense of detachment, distance, leavened with complacency felt between different levels of leadership. --- Core Principals are undefined. Judgement is out-sourced. Trust between Unit and Tactical Leadership is missing. - Do I trust my subordinate leaders in the field? If yes, give him what he needs. That is not an easy question - but it is one that has to be founded in a mindset and a level of trust between leaders - with both commissioned and non-commissioned officers. Knowledge that we trust their judgement based on the fact we know they understand our mission, our commander's D&G, and the specific needs for those under their charge. They have the training and facilities to make the right call. That is the mindset - the result of selecting, training, promoting, and developing leaders that have earned the trust that enables a mindset build on that trust - it is self-reinforcing. When that doesn't exist, you develop a bureaucratic, dare I say Soviet, mindset. You have no trust in others - only the orders you have from higher. You don't believe in judgement, only the judgement of those who wrote your orders. If there is "white space" then that needs to be filled from - you guessed it - from higher up the chain. You don't lead - you manage the orders given to you by others. You don't look for gaps, you ignore them. It is a mindset of fear. Do we want officers or automatons? Our nation's history is full of officers who found themselves in situations where they could not "just follow orders" and had to use their training, education, and judgement ... and if that failed ... then their commanders would rely on their subordinates' .... character. A commander who has trust and confidence in his leadership and subordinates' leadership intentionally writes D&G that has "white space" to give his leaders in the field running room. He knows that he has officers who, on balance, have the judgement, character, and understanding of the profession of arms to carry out what needs to be done for the mission at hand. Likewise, you must have officers on the receiving end that meet that expectation. Even in the best of circumstances, that doesn't work out sometimes. When things do not work out the way they should in that chain of events from the Operational Level through the Tactical down to the Unit - you need to ask broader questions once you get past the, "He asked for X and they did not give it to him because of Y, and as a result Z happened." You have to ask if we have a system that promotes and encourages the right officers with the right mindset. A military gets the officers it recruits, trains, and promotes. What are our criteria? What are our priorities? What do we reward? What do we punish? Remember, it is almost never the superficial characteristics of the individuals in the ranks, but the quality of their leadership that makes the difference. Along those lines, let's pivot slightly to Tom Rick's post over at FP. In it he brings back someone we haven't visited with since 2007, Col. Paul Yingling, USA. You need to read it all - but here is the parts that are germane to our discussion. Claims that today's wars are somehow more complex than previous conflicts will draw belly laughs from historians. Is sectarian conflict in Iraq somehow more politically complex than Rome's civil wars? Does the rate of technological change in the last ten years in Afghanistan exceed that of the last two years of World War I? 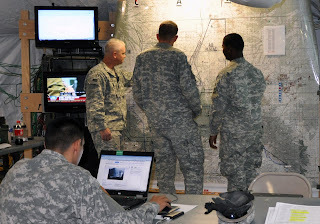 Even if we accept the dubious proposition that today's wars are unparalleled in complexity, successful brigade commanders have demonstrated that mission command works. Colonel Sean McFarland helped turn the tide in Anbar Province thanks in large part to the autonomy he granted to Captain Travis Patriquin. Colonel H.R. McMaster's success in Tall Afar was attributable to a command climate in which thinking was required and PowerPoint was not. Have new and unparalleled complexities transformed warfare since 2006? ... Thick orders and elaborate SOPs haven't eliminated costly, stupid mistakes. Consider two of the most heavily regulated activities on the modern battlefield -- air strikes and detainee operations. Air strikes have killed civilians and ground troops have abused detainees, even when the SOPs regulating these activities ran to several hundred pages. ... Leaders prone to crimes and blunders are not dissuaded by elaborate checklists or sternly worded prose. Yet the production of highly prescriptive orders and SOPs, what Germans call Befehlstaktik, continues unabated; why? The primary purpose of detailed orders is not battlefield success, but rather the protection of field-grade and flag officer careers. In ten years of war, no Army general has relieved a fellow flag officer for battlefield failure. Why so many failures and so little accountability? When a small unit gets in trouble, senior commanders find cover in SOPs thick enough to stop an OER bullet. (I told the troops not to beat detainees; it's right here on page 11.) Rather than preventing battlefield failure, detailed planning often enables it. Senior officers can survive almost any debacle so long as there's a FRAGO and a captain between them and the problem. Detailed planning can be useful in understanding problems, anticipating opportunities and risks and synchronizing activities. Prescriptive orders and SOPs have their place in performing routine mechanical tasks. However, these techniques are often counterproductive in the fog and friction of combat. Modern combat requires junior leaders capable of exercising judgment and initiative, and senior officers capable of fostering these qualities. It requires junior leaders capable of acting on commander's intent, and senior officers capable of clearly expressing their intent. It requires junior leaders capable of taking prudent risks, and senior officers willing to underwrite and reward risk-taking. Sorry Tom and Paul for taking such a long pull-quote - but that is so full of win, I can't help myself. After a decade of war - the Army still has a lot of work to do in order to refine its culture. 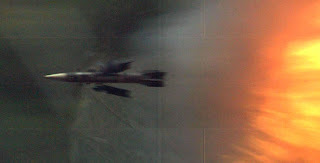 That should give Navy a pause - we have not had anything close to the trial by fire experienced by the Marines and Army. We are thick with toxic cultural problems, unpurged by the unfudgeable truth of combat. I don't think we need to go through the list again. We haven't even started to clean house - and I would offer with the latest promotions at the highest levels, we aren't going to begin soon. No institution, much less a military one, is perfect. With continual critical review though, it can get better - evolve - adapt. When critical review is squashed, diminished, mau-mau'd or aggressively punished, then over time a military will degrade, become ineffective, and then put the nation it serves at Strategic Risk. 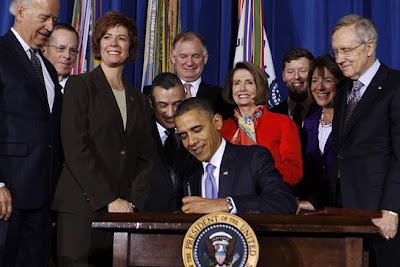 The Army in the last decade has brought out some great critical thinkers; Nagl, McMaster, Yingling and others; some on active duty, some retired, some have just gone home. Through their efforts, the Army has improved - all that from an institution still seen by many as hide-bound. Where is our Navy's Nagl, McMaster, Yingling and others? I can think of a few - some we hear from more than others - some we have featured here and on Midrats. Some of the best I know who are still on active duty only communicate via email or FB where they once had a much higher profile. Why? Simple - our Command Climate is worse than the Army's when it comes to dissent. We have had our exceptions when it comes to leaders willing to listen to criticism - Admirals Stavridis and Harvey come to mind .... but where are those coming behind them? Out front? No. Toiling away behind the scenes? Yes. Why behind the scenes? Simple as described to me by them; fear. Well founded fear; but fear. Every time they stick their head out, they get professionally mau-mau'd to the point they pull their head back inside their shell. After all, they do have a family to feed and hope for future positions of influence; and honestly that is OK. I haven't been the greatest example of intellectual courage either - for the same reason. Is it really the best path to improving our Navy, pushing our best thinkers in to the shadows? Classifying our INSURVs to hide only our shame from public view? Rewarding the parrots while punishing the eagles and Capitoline Geese? While Nagl pulled a Salamander and punched out near the first exit - McMaster and Yingling are still on active duty. McMaster received much deserved top-cover to make BG and it is nice to see Yingling in a great O6 job in Garmisch-Paremkirchen. They are still out front - giving as well as they can to make the service they love better - and by doing so - providing great service to their nation. Creative friction - the heat and sparks of future victory. BZ to them. What does all this have to do with Ganjgal? Everything. It has to do with how we select, train, and reward leaders - and how those leaders then carry out their responsibilities. It is a larger story than Ganjgal and needs to be reviewed by leaders in all services, because we can all learn from it. By study, perhaps in the future we will see more CDR Evans, and less Ganjgal TOC. I join Skippy in OUTRAGE!!!!! Is tomorrow already going to be Thursday? How do you say "Sea Apache" in Russian?